Here is a way of looking at the history of the so-called Israeli occupation of so-called Palestinian land: History is narratives. Narratives are stories. Stories have beginnings, middles and endings. Human history has no end in sight so nobody knows how this story of our sojourn on Earth is going to end, or even if it will end. Many theories abound, all of them faith-based whether or not they incorporate God or Gods, or Holy Spirits, or vapours or black holes or nano-particles. We have stories about how it all began and these stories are also faith-based. Every religion and every science has its story of human beginnings on Earth. And, of course, there are stories within stories. Israel versus Palestine is a story within the larger Middle East story. It used to be Israel versus The Arabs and then by the late 1980s this turned into Israel versus Palestine. So anyone born after 1980 probably sees the problem with Israel — let me call that the PWI — as the Israeli-Palestinian conflict. I wonder how many of us born in the 1960s and earlier remember how the PWI used to be the Israeli-Arab conflict. It is merely a matter of punctuation. Below is a list of possible punctuation marks in history. I think it becomes obvious how that changes the entire narrative. If you only started paying attention to the story beginning in the late 1980s, when everyone really starting going on about Israeli occupation of Gaza, The West Bank, and East Jerusalem, then you believe that Middle East peace requires Israel to end an occupation. You may think that Judea and Samaria was always called The West Bank. You also think that there was once an Arab country named Palestine and an Arab people who were always called Palestinians and that they are indigenous to that country that you think once existed. If you only started paying attention to the story, or believe it began shortly after the 6-Day War in June 1967 that saw Israel regaining control over Judea and Samaria, East Jerusalem, and the Gaza Strip, when the stage was set to invent the phrase “land for peace”, then you believe that if Israel would just relinquish land recaptured in that war, there would be peace in the Middle East. You might know there was never an Arab country called Palestine and that most Arabs would never countenance being called Palestinians before the mid-1980s. Then again, you might have known it once and since forgotten that fact. If you think the story began in 1948, with Israel’s declaration of independence and recognition by the UN, then you believe that the UN created the State of Israel, and that Israel was created because of the Holocaust. You may believe that peace requires that the Arab world simply accept the existence of Israel as a Jewish state. You see the conflict as Israel against the entire Arab world, or more to the point, the whole Arab world against Israel. You know that the name Palestinians referred to the Jews before the declaration of Israel’s independence. You know that Jordan was created out of over 70% of the British Mandate of Palestine and that the Jews were supposed to build their nation on the land between the Jordan River and the Mediterranean. You know that the Arabs rose up in protest against that and so the UN offered to partition the part of Palestine still left to the Jews and offer more than half of that to the Arabs as another Palestinian Arab state; and you know that the Arabs rejected that, meaning that the modern State of Israel was still supposed to have been between the Jordan River and the Mediterranean. And that is what it would have been had all the Arab countries not risen up and invaded the nascent modern state. You probably think that the armistice lines drawn at the point the war ended were borders and yet you may recognize the fact that Jordan illegally annexed East Jerusalem and Judea and Samaria, renaming the latter the West Bank and forcefully exiling all the Jews from that land, those they did not kill, that is. Similarly, you may know that Egypt occupied the Gaza Strip and forcefully exiled all the Jews living there. You probably think the solution involves negotiations over the disputed territories, or, if you recognize that they only became disputed because the Arabs refused to accept sovereign Jews in their midst, you may believe the solution is for the Arabs to admit that they tried to defeat Israel, they failed, and life goes on so get over it already! If you believe the solution is turning the clock back to before 1948, let us say to 1946 or 1947, then not only would the modern State of Israel cease to exist, but so would independent countries freed from the Soviet Union, Bangladesh, Jordan, Kuwait, North Korea, Pakistan, and others, and the following countries would no longer be sovereign but would return to their former colonial status: most of the current African sovereign states, the Bahamas, Bahrain, Barbados, Belize, Brunei, Cambodia, Dominica, Dominican Republic, Granada, Guyana, Jamaica and the other Caribbean island states, India, and more. If you are turning the clock back on one country, you need to do it for all countries. Otherwise, it just looks like pure antisemitism. If you think the story began sometime after World War I, then you may be confused. But I will make it simple. In 1922, a legally binding memorandum was signed by the League of Nations in which sovereignty of the area between the Jordan River and the Mediterranean Sea was recognized as belonging to the Jews. The only Palestine that existed then was the British Mandate of Palestine and the land under this mandate was divided into Israel and Trans-Jordan. Palestine of that time was a geographic and not a political region. Had there been no PWI, in other words, had the Arabs not complained about having independent Jewish neighbours, then there would be Jordan on the east side of the Jordan River and Israel on the west side of it and peace would have reigned. However, while some Arabs have been pretending that history began in 1947, when they were offered the partition that they rejected, others are claiming it started with Balfour’s (cursed) letter. So if they want to go back to 1920-22, or even 1917, the year of the Balfour Declaration, then it is true that there would be no modern State of Israel. There would also be no Lebanon, Jordan, Syria or Iraq. There would also not be many other currently independent countries in Africa, Asia, the Caribbean and Latin America. Tibet would still not have been occupied by China. I doubt the world is prepared to set the clock back for any but the Jewish country, and as mentioned above that is antisemitism. Shush! Don’t tell anyone. Don’t want to upset people by calling them antisemitic when they think they are just being anti-Zionist. If you think the story began about the year 600 CE, then you will know that Israel, or rather the Kingdoms of Judea and Samaria, had fallen to Rome so at that time there was no independent Jewish state (which means that you know that they existed). You will also know that there was no Islam at that time; Mohammed was born in 570 and apparently only began recording his prophesies at the age of 40. When he escaped Mecca for Medina in about 620, the latter was then a cosmopolitan center called Yathrib. The entire world at that time was a system of tribes, some nomadic, some sedentary, some peaceful and some warlike. Jewish tribes wandered freely and were settled extensively across the Middle East and parts of Asia. There were few countries in the world then, none in the region of interest here, more a fluidity of changing boundaries and identities of kingdoms and empires as territories were won and lost. 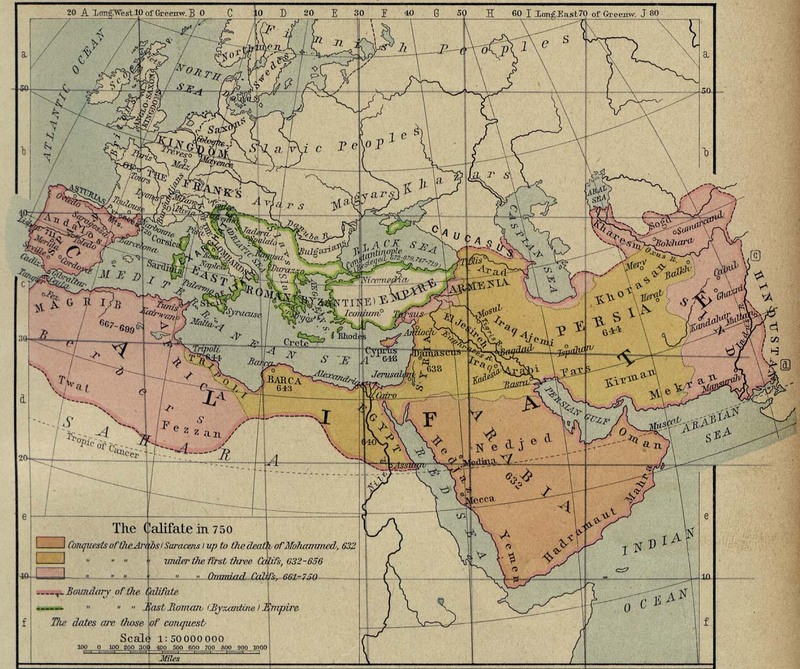 It was between 650 and 800 CE that the Muslim Conquest claimed most of the Middle East, southern Europe, northern Africa and stretched into Asia. So if you want to go back to 600 you can clear that slate and give the indigenous tribes of all those regions another chance to rewrite their histories to favour their own sovereignty. This means, of course, that Europe returns to being a collection of tribal kingdoms and there is no Canada, United States, Australia, etc etc etc. Are you game to push the reset button to that period of Middle East and global history? Wherever you want to begin telling the story of the Middle East, or from whatever perspective you want to view the PWI, just know that within most of known human history, you can find recognition of an independent Jewish entity that predated almost all countries in the world and therefore is decidedly not a UN creation but a British-League-of-Nations-UN-recognized ancient sovereign nation. And absolutely nowhere you look will you find a Palestinian Arab entity by that name or any other, other than the modern state of Jordan that decidedly is a British-League-of-Nations-UN creation. So now let us start talking about occupation and the right to exist! Steven Blowers: Why Do I Call Myself a “Christian Zionist”? The feature image that appears on the homepage and also on social media shares. – I don’t think that ‘between the Jordan and the Mediterranean’ was perceived as the fall-back position if the Arabs rejected the UN partition plan. I think there is still a perception that the Jews’ share was the UN partition plan area. Given the fact of Arab attack and that the UN plan area was indefensible, the Jewish state expanded its boundaries. It was not the “fall-back” position. It was what Israel was supposed to be. Only because the Arabs put up such a fuss was another partition of the Mandatory territory suggested and they rejected that because THEY wanted it all. Given that the Arabs attacks, the Jews defended themselves and the ceasefire lines were where the armies were when the fighting ended. Nothing more nothing less. Had the Arabs not attacked, Israel would not have sought to expand her boundaries because there would have been no need. Sheri, I definitely fall into the category of remembering when it was the Arab-Israeli conflict. (I’m 61.) I do remember the Six-Day War and the time when Israel had to deal with the hostile neighbors. I also remember the Yom Kippur War and how shocking it was when it was declared. I also remember the Israel-Egyptian treaty and how we all hoped that this would lead to a greater peace. Now, well after Oslo, I am wondering if the Arabs still think it’s 1948 and the War for Independence never really ended. The focus has been on Israel and the Palestinians, but after all this effort I am not sure if all the peace gestures accomplished anything, or (to use an expression my wife’s friend coined) we will see peace “when Moshiach comes.” Sadly, I have a feeling we will be fighting the Arabs until then. Perhaps part of the problem with really understanding what is going on is that there are only us dinosaurs who remember when it was the Arab-Israeli conflict and some of our dinosaur peers seem to have forgotten that fact. And yes, I agree with you that the Palestinian Arabs (and perhaps other Arabs as well) seem to think they are still fighting back in 1948. Thanks for this. While I agree that the Palestinians are largely an invented people, they are still people with homes, properties, businesses, memories and history with the area they have lived in for many decades. The tragedy that Arabs and the Palestinian subset of Arabs rejected offers of two states for two peoples is overshadowed by the tragedy of a population today that, for the most part, hates Jews, hates Israel and loathes the West. From what I have read, most efforts to build a peace movement among Palestinians or to normalize relationships with Jews are brutally quashed. Are there any independence movements as fueled by hate that have been able to “move on” and build a civil society? It is difficult to conceive of a Palestinian state that would not become infested with Islamic state or similar hate based wretches of the earth. You ask an interesting question – are there any independence movements as fueled by hate that have been able to move on and build a civil society? Excellent, Sheri! A good departure from the usual “Israel is Palestine, Palestine is Arab” dissertation. We need new ways of showing the truth so that those who don’t know it — and want to know it — have a different viewpoint on the subject. Thanks! Glad you feel it works. Thanks. Brilliant! What a relief to read essays like that. Thank you, Sheri. Thanks so much for saying so. Jordan is not a UN creation. Transjordan (renamed Jordan in 1949) was created as an independent State out of the Mandate for Palestine by Great Britain on 22 March 1946 as acknowledged by the League of Nations at its last meeting before it was dissolved on 18 April 1946 in this resolution:. Duncan Hall (1948). Mandates, Dependencies and Trusteeship. p. 267. Whilst article 25 of the Mandate had acted to “postpone or withhold” the right of the Jews to reconstitute the Jewish National Home in an area covering 77% of the Territory covered by the Mandate – Britain’s action in granting Transjordan independence in 1946 sounded the death knell for any such Jewish claims being made. 77% of the Mandate territory of Palestine had thus become an independent Arab State in 1946 before the United Nations Partition resolution was proposed in November 1947 to create the remaining 23% into one Jewish State and a second Arab State – in addition to Transjordan. This plan was accepted by the Jews but rejected by the Arabs. Ironically a reverse Balfour Declaration had taken place in 1946 with the Arabs gaining an independent State in 77% of Palestine two years before the Jews. What decidedly was a UN creation however was article 80 of the UN Charter which preserved the rights of Jews to reside in Judea, Samaria and East Jerusalem under the rights vested in them by article 6 of the Mandate for Palestine. Resolution 2334 is clearly in breach of article 80 and is not worth the paper it is written on. The Security Council cannot act outside the limits of the UN Charter. OK. I accept your clarification – so I can revise my last paragraph to say that Jordan is a British-League of Nations creation. That should do it, eh? Yes that would be a fair revision. Next story Syria’s Fahad Almasri Continues To Woo Israel – Is He A New Sadat? Previous story Algemeiner and JNS: Furthering Palestinian Propaganda?